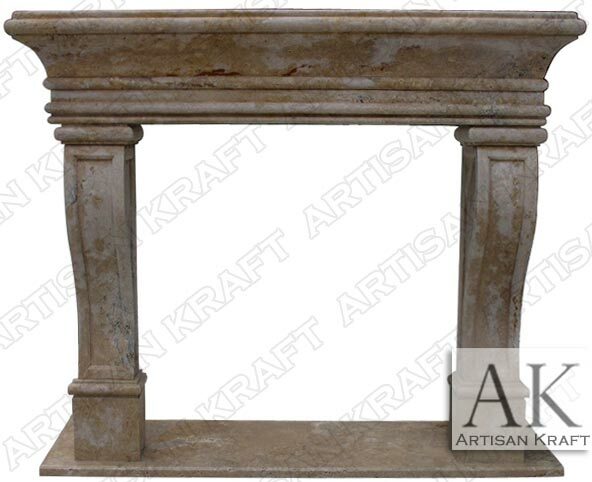 Carved from solid travertine in a beautiful French design. Big and bold with a variety of texture and color the Leon travertine mantel is sure to grab your attention. The dark patterns in the travertine add a carved like look. Paneled corbel legs and swopping mantel shelf up top. Travertine can add an antique look and certain stones will give it an aged antique rustic appearance. We make this from cast stone and GFRC very frequently. The delivery on cast stone is quicker. We also offer a great selection of stone sinks. Stone: Black Marble, Precast, travertine, limestone, sandstone, marble etc. Available in many different colors, textures and finishes.